I love shapechanging dragons, and was pleased to find that this book had them in scores. 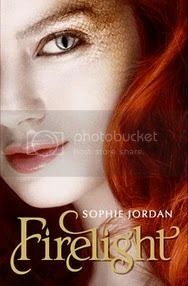 Sixteen year-old Jacinda Jones is all but promised to Cassian, the alpha male heir-apparent to their isolated mountain community of dragonkin. The draki society contains several different subtypes of draki with different powers. They live mostly as humans, only occasionally taking dragon form. Jacinda is a super-rare fire-breather, and the other draki in their village can't wait for her to start having children, hopefully repopulating their kind with fire-breathers again. Jacinda's a bit of a rebel and a risk-taker and the last thing she wants is to mate with pushy, demanding Cassian. After a forbidden sunrise flight, and a close call with draki hunters, their tribe wants to clip her wings - all but tying her up to force her to breed. Her hard-edged mother decides the only way to save her is to relocate to the desert - hoping the hot dry weather will kill off Jacinda's draki half and shapechanging abilities altogether. Once they've made their escape from the cool, foggy mountain home, Jacinda's younger twin sister Tamra is delighted to finally not have to play second-fiddle to her superstar older sister. Tamra loves the opportunity to finally be able to go to a normal high school and quickly makes new friends. While Jacinda has never been attracted to Cassian, and is glad to be free of the pressures and politics of the draki society, she loves flying and doesn't want to give up her dragon form. She's desperately holding on, by sneaking out for a few nighttime practice flights, and winds up meeting sensitive, handsome Will, who, it turns out, is the youngest son in a family of murderous draki hunters. There's a real forbidden Romeo and Juliet aspect to their romance. I can't wait to dig into the sequel, Vanish.